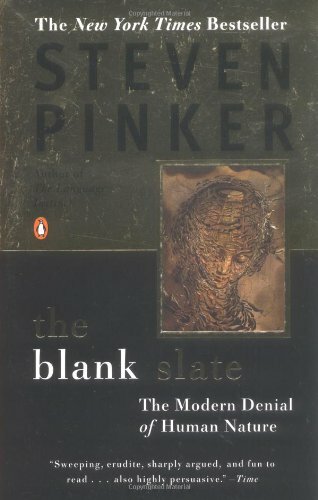 Steven Pinker, one of the greatest minds in linguistics and evolutionary science, thoroughly debunks the blank slate theory that still dominates the standard social science model. This tabula-rasa/blank-slate theory is responsible for most serious mistakes in social theories and public policies of the last century in fields like education, discrimination, gender relations. It also is related to rejection of inheritance based evolutionary theory. All this is very central to Human-Stupidity: how can a ridiculously false theory dogmatically dominate science and public policy for decades. “Children that are beaten by violent parents become violent adults”. There usually is no test for the alternative hypothesis that this has nothing to do with genetics, but that these children could have genetically inherited violent traits from their parents. Evolutionary Psychology Primer & Reading List | Human-Stupidity. "Children that are beaten by violent parents become violent adults". There usually is no test for the alternative hypothesis that this has nothing to do with genetics, but that these children could have genetically inherited violent traits from their parents. Sounds like the social psychology equivalent of the “saturated fat equals heart disease.” Conventional wisdom, especially when it is dead wrong, has a way of sticking. Could be because ppl want to belive in it. I did not appreciate the swipe at Chomsky among other things. I am now sold on the idea that I should read Pinker. From Boas on down, social scientists have admitted that there’s probably a biological component to human behavior. WHAT it is and HOW MUCH it influences is the issue, not whether it exists. Nice try. The name of your link says it all. What’s the difference between the Blank Slate and the Almost Blank Slate? Probably a biological component to human behavior…that is so infinitesimal as to be irrelevant; the Almost Blank Slate. Er, sorry. 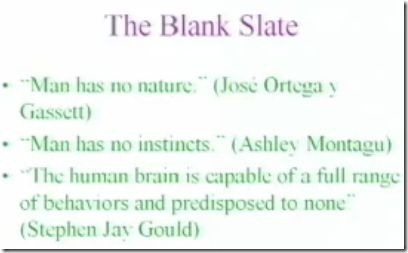 Nice rhetoric, but the “blank slate” model has NEVER dominated the social sciences. From Boas on down, social scientists have admitted that there’s probably a biological component to human behavior. WHAT it is and HOW MUCH it influences is the issue, not whether it exists. Schlinger’s critique of Pinker’s work is quite interesting. Next Next post: Evolution, Intelligence, Behavior, Race.